Girl Scouts from throughout the United States took to Capitol Hill earlier this week to join GSUSA leadership, members of Girl Scouts’ Honorary Troop Capitol Hill, and more than 200 leaders from government, the military, and academia to celebrate the 100th anniversary of Girl Scouts’ highest award and to recognize the amazing girls and women who have earned it over the past century. 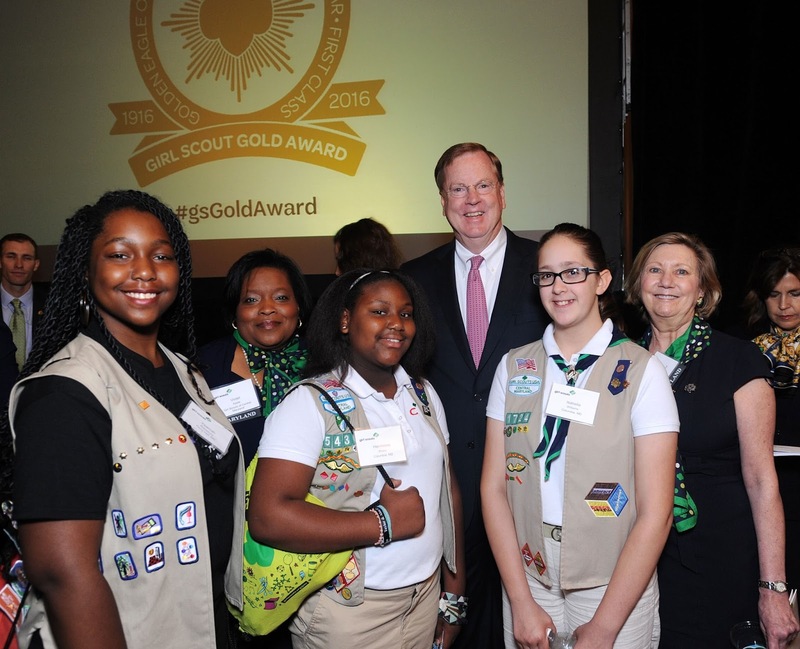 The Girl Scout Gold Award is a symbol of excellence and ingenuity and a testament to what girls can achieve—to their vision and fortitude, leadership and dedication. This centennial was a truly special occasion, marking 100 years of projects whose cumulative effects have rippled across time and geography, and helped to transform our world forever and for the better. 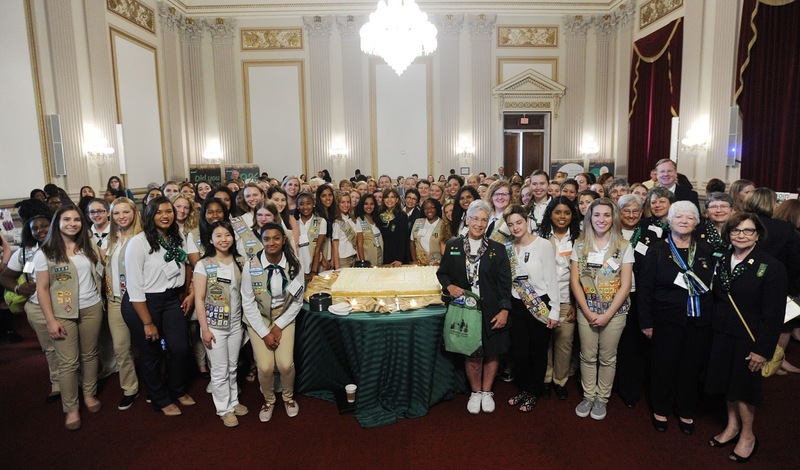 More than 200 Girl Scout Gold Award recipients, members of Congress, Girl Scout leaders, and leaders from the military and academia were present for the centennial cake-cutting on Capitol Hill. Speakers were members of Congress, including senators Shelly Moore Capito of West Virginia and Tim Kaine of Virginia, representatives Cathy McMorris Rodgers of Washington, Donna Edwards of Maryland, and Rosa DeLauro of Connecticut, among others, as well as Brigadier General Diana Holland, commandant of cadets at the United States Military Academy, and Patricia McGuire, president of Trinity Washington University, which awards Gold Award recipients scholarships. Sashini Passela, a 16-year-old Gold Award recipient from Girl Scouts Nation’s Capital, talked about her project and how she worked to bring opportunities in STEM fields to girls in her parent’s home country of Sri Lanka! Known today as the Gold Award—and in the past as Golden Eaglet, First Class, and Curved Bar Award—Girl Scouts’ highest award was established in 1916. Earning a Gold Award requires girls to take action in a sustainable way by identifying local or global issues and working to resolve them for future generations. Over the years, Gold Award recipients have improved the lives of millions of people around the world, with achievements that range from rallying a community to clean a local waterway to introducing young girls to STEM, from creating a program to teach swimming to underserved youth to starting a shoe drive to help people in India go to school and work. And these are only a few. Mike Groff, President and CEO of TFS USA joined the celebrations. The terrific day was sponsored by Toyota Financial Services (TFS), whose financial literacy partnership with Girl Scouts of the USA (GSUSA) has helped empower 26,000 underserved Girl Scouts across the country to become financially savvy leaders who could, potentially, take on projects that let them go for gold! Following the Capitol Hill celebration of the Gold Award, Girl Scout council CEOs and their Gold Award recipients met with their members of Congress to raise awareness of the Gold Award, discuss their projects, and talk about how their work is helping to improve their communities and communities around the world!